Following the boring and pretentious defacement of a boring and pretentious artwork by Mark Rothko in Tate Modern last week comes a somewhat more imaginative piece of artistic 'vandalism', this time perpetrated in Milton Keynes. 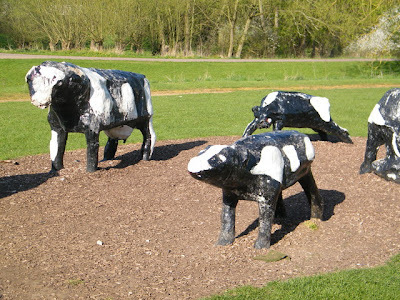 Milton Keynes itself (I apologise if you are a resident) is not, it has to be said, the most visually distinctive or appealing of places, and the fact that its concrete cows were one of its most noteworthy features served only to highlight that fact. The cows themselves, as can be seen from the first of the pictures below, were neither the most faithfully rendered nor inspired of creations, and looked rather drab. 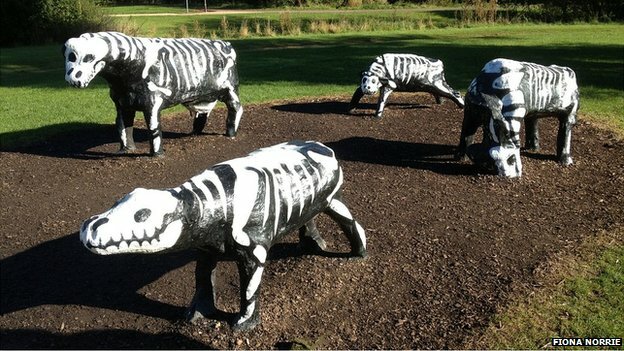 Following an imaginative piece of 'vandalism' however, they were rather humorously changed into a group of skeletal 'cows', and actually, to my mind, look all the better for it. Now, although not condoning vandalism, would you support The Parks Trust in its decision to repaint them at a cost of £2,000, or do you think that the sculptures look somewhat better following their inventive transformation? Should they stay as they now are? Where do they get a figure of £2,000 to paint a few concrete cows? Is this special NASA paint that can withstand the heat of re-entry? Does the pain contain gold? What a ridiculous sum of cash. No wonder trust is being lost with local councils and in this case the Parks Trust if they can squander that amount of money on such a simple task It probably cost the vandals about £40 in paint in the first place! Overheads Rob. Overheads. I much prefer them as they are now, and whoever did this, did it for free.